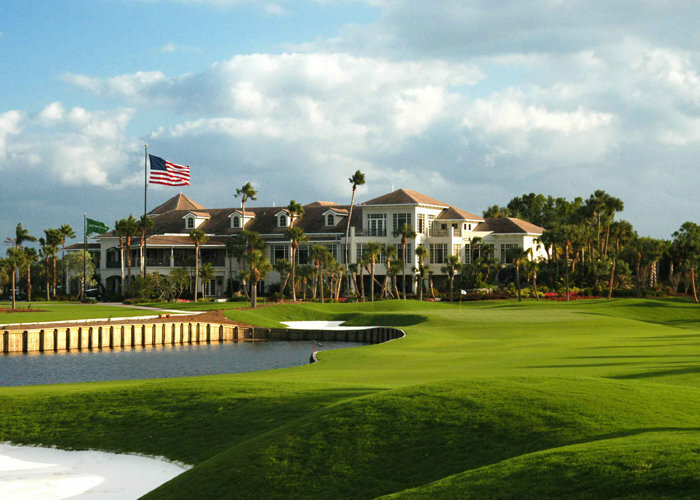 The Loxahatchee Club, located in Jupiter, Florida, is a 5-star private club. Situated on 340 acres it offers 285 homes built on prime lots. Residents can enjoy 71 acres of freshwater lakes and 40 acres of green belt. The Loxahatchee Club features a full-service fitness center that offers massages and trainers. In addition, members enjoy tennis courts, dining and a lagoon style pool. Aside from the aforementioned luxury amenities, perhaps the gem of the Loxahatchee Club is that it is home to a Signature Jack Nicklaus designed golf course built in 1980. The 18-hole course is 7147 yards in size and is one of the most challenging. Because of all this and more, the Loxahatchee Club has been recognized by Platinum Clubs of America and is designated among the top 3% in the industry! Custom estate in The Loxahatchee Club with breathtaking lake and golf course views can be seen from this 5,772 sq ft 4 bedroom, 4.5 bath exquisite home with luxurious appointments. Enter through double etched glass doors into the grand, two story foyer and be struck by the dramatic floating staircase with the spacious living room beyond. The living room boasts triple French doors, a gas fireplace, built ins and detailed architectural millwork.